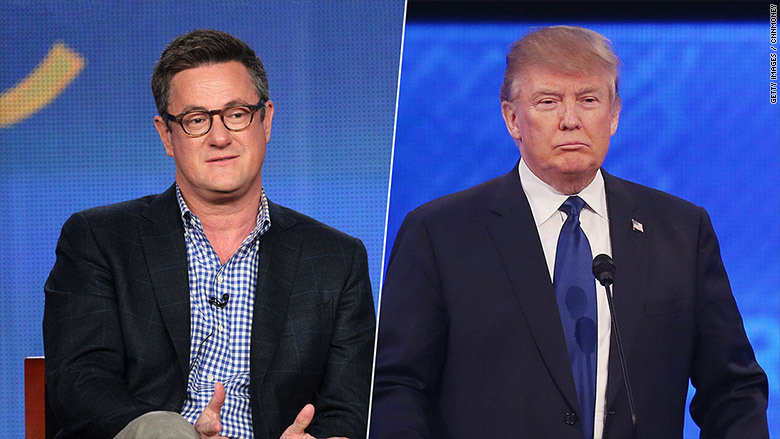 Joe Scarborough wants to make nice with Donald Trump. Last week, Scarborough and his "Morning Joe" co-host, Mika Brzezinski, visited the Republican presidential nominee at Trump Tower to rekindle a once-rosy relationship that has turned bitter and adversarial, sources with knowledge of the meeting told CNNMoney. The three also discussed the possibility of conducting an interview for "Morning Joe," though nothing was decided or finalized, one of the sources said. Scarborough did not respond to a request for comment. The meeting, which NBC and the Trump campaign both declined to comment on, comes after a summer of barbs and insults. Trump has repeatedly slammed Scarborough and Brzezinski on Twitter and even spread a rumor that the two were romantically involved. Meanwhile, Scarborough and Brzezinski have been increasingly outspoken in their criticisms of Trump. Just three weeks ago, Scarborough released a song and music video he made in which he mocked Trump as "a soft and flaccid man" with "tiny little hands" and referred to him as "Amnesty Don," a nickname he'd given Trump earlier. The need for any rapprochement is surprising, given how close Scarborough and Trump used to be. Throughout the Republican primaries, Scarborough was one of Trump's biggest media boosters. He praised and defended him on the show, offered campaign and debate advice in private, and even refused to rule out the idea of one day being Trump's running mate. "You guys have been supporters, and I really appreciate it," Trump told the co-hosts after he won the New Hampshire primary. "Not necessarily supporters, but at least believers." While Scarborough's support for Trump was a source of concern for his colleagues at NBC News and MSNBC -- sources at the time described it as "over the top" and "unseemly" -- the host frequently denied any favoritism. In a new interview with GQ, Trump recalls how Scarborough called him after one of the primary debates to congratulate him: "He said, 'Congratulations, you have just become president! You killed everybody,'" Trump told GQ. "And then I watched the show the next morning, and he didn't say that. I called him and asked him why. He said, 'I don't want people to know how good friends we are.'" The friendship began to sour in the spring, after Scarborough suggested that Chris Christie and Bernie Sanders were bigger ratings draws than Trump. "He basically said we weren't his friends anymore," Scarborough told GQ. In May, Scarborough announced on air that he would not be voting for Trump. Trump responded, in his usual fashion, with a tweet: "Joe Scarborough initially endorsed Jeb Bush and Jeb crashed, then John Kasich and that didn't work. Not much power or insight!" he wrote. As Scarborough and Brzezinski grew more critical of Trump on their show, Trump grew more aggressive on Twitter. "I don't watch or do @Morning_Joe anymore. Small audience, low ratings! I hear Mika has gone wild with hate. Joe is Joe. They lost their way!" Trump tweeted in June. "Tried watching low-rated @Morning_Joe this morning, unwatchable! @morningmika is off the wall, a neurotic and not very bright mess!" he wrote in August. "Some day, when things calm down, I'll tell the real story of@JoeNBC and his very insecure long-time girlfriend,@morningmika. Two clowns!"